Protect Your Family from Tick Bites this Summer! With the warm weather here and more opportunities to spend time outdoors, it’s important to remember these tips to prevent ticks from affecting your summer. Be sure to protect yourself, pets and your property from these pests. The most effective way to avoid ticks when outdoors is to avoid contact with soil, leaf litter and vegetation. However, if you hike, camp, hunt, work or otherwise spend time in the outdoors, you can still protect yourself. Learn more about tick-borne diseases, prevention and proper removal! Wear enclosed shoes. If wearing long pants and sleeves tuck your pant legs into socks or boots, and shirt into pants. Check clothes and any exposed skin frequently for ticks when you are outdoors. 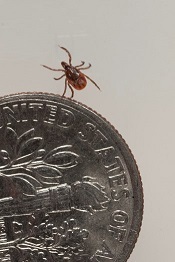 Avoid dense woods and bushy areas, as tick climb upwards to find hosts. After going indoors at the end of the day, do a full-body tick check and try to bathe or shower within two hours of returning to more easily spot ticks that may be on you. Be sure to check your pets as well! In your yard, reduce shady and damp areas and clear any leaf litter or seeds from the ground. Replace plants that deer love to browse with deer-resistant plants. Consider installing a deer fence to help reduce deer from dispersing ticks. An extremely effective way to kill ticks on exposed clothing is to tumble the clothing in a dryer set on high heat for at least 10 minutes. Products that contain DEET, picaridin, oil of lemon eucalyptus and IR3535 are repellents. These products interfere with the host-finding abilities of biting insects, making you hard to find. Products that contain permethrin and some plant-based oils are pesticides that kill these organisms on contact. They can be used to treat clothing, hats, shoes, and gear, but, for safety reasons, should never be applied to the skin. Visit the New York State Pesticide Administration Database (NYSPAD) to search for personal insect repellents registered in NY for personal use. For further information and tips, check out the DEC's "Be Tick Free" page! Questions or concerns? Please email PestMgt@dec.ny.gov or call (518) 402-8748.